A playlist provides a way to play the same template and content on multiple content players. Override the scheduled content on one or more signs, e.g., in order to play an emergency message. To edit, right-click the Playlist, and select Properties. The Properties window displays. To assign one or more template to a playlist, drag a template from the Template library and drop it on the playlist in the Network Tree. To schedule content on the playlist, drag a content item from the Content library and drop it into a region in the playlist’s template. Right-click a playlist, and select Properties. The Properties window displays. A player can support multiple playlists. For example, users may have a playlist on the top Location level and also Playlists in sub-Locations. The player looks inside its location for a playlist, and then it looks for playlists in its parent location, then its grandparent location, etc. The behaviors of the playlist apply, too. Changes made to a playlist’s properties have no effect on the signs until they are deployed to the Content Players. 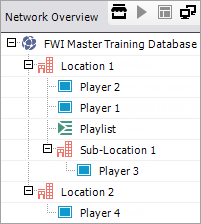 Name - Label for the playlist as it is to display in the Network Overview. Enabled - Used to deactivate a playlist (e.g., while it is under development) so it is not used by any signs. Behavior - Denotes how the playlist is used by the signs in the playlist’s location and sub-locations. 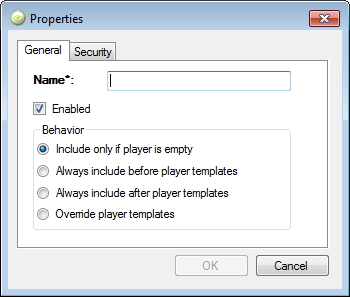 Include only if player is empty - Playlist runs only if the Content Player itself contains no templates. Always include before player templates - Playlist runs prior to playing the other templates scheduled on the content player. Always include after player templates - Playlist runs after playing the other templates scheduled on the content player. Override player templates - Playlist runs in place of the scheduled templates on the content player. If security has been enabled in Content Manager, meaning at least one user has been added to the Users library, and the user is a member of the Administrators group, a Security tab displays. By default, users and groups added to the Users and Groups libraries have no rights other than the ability to launch Content Manager. Rights must be granted in one or more Properties windows in order for the users to be able to accomplish more. Note: The University of Illinois Digital Signage Service uses Active Directory Groups to grant rights. Some campus units use only AD security groups managed by the Digital Signage Service Team while others utilize their own security groups. For more information please contact your organizations digital signage coordinator and/or the Digital Signage Service Team. 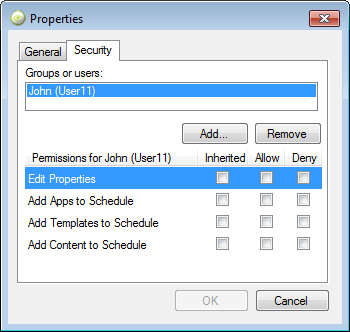 Edit Properties - Grants the right to change the attributes recorded in an object’s Properties window. This right can be overridden in Template Properties and Region Properties. Add Apps to Schedule - Grants the right to drag and drop apps from the Apps library onto this playlist. Add Templates to Schedule - Grants the right to drag and drop templates from the Template library onto this playlist. Add Content to Schedule - Grants the right to schedule content items, e.g., drag and drop a content item from the Content library onto a template region in the Network Tree. This right can be overridden in the Template Properties or Region Properties windows. Playlists are automatically deployed when a user deploys to any of the Content Players in the same location as, or in a sub-location of, the location that contains the playlist. For example, in the following Network Overview, the playlist applies to Player 1 and Player 2 since they are all in the same location (Location 1). The playlist also applies to Player 3 since it is in a sub-location of Location 1. However, the playlist does not apply to Player 4 since it is in a different location (Location 2).